Developed by medical researcher Loren Cordain, the Paleo Diet revolves around the concept that, for better health, humans should eat the same foods as the hunter-gatherers of the Paleolithic era. This type of diet, Cordain claims, can help reduce common diseases such as type-2 diabetes, cancer and gout, as well as conditions such as acne. This way of eating – which resembles a low-carb diet – is strict and not for everyone. Talk to your health care practitioner before drastically limiting the types of food you eat, as the Paleo Diet requires. Ample protein is the cornerstone of the Paleo Diet – in fact, while a typical U.S. diet comprises approximately 15.5 percent protein, according to Cordain in his book “The Paleo Diet,” this way of eating aims for 19 percent to 30 percent protein. Not all meats are created equal, however – you are only allowed to consume grass-fed meat because it has a lower concentration of omega-6 fatty acids, along with free-range poultry and wild fish. 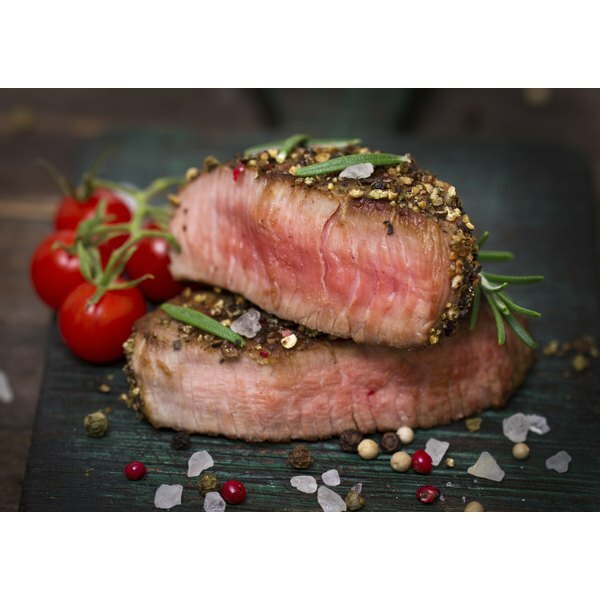 High-protein meats allowed on the diet include lean beef, lean pork, skinless turkey and chicken breast, fish such as halibut, snapper and tuna and shellfish such as shrimp, clams and mussels. You can also experiment with organ meat and game meat such as alligator, bison and elk. Fresh vegetables are allowed in limitless portions on the Paleo diet, so long as they’re not starchy tubers like potatoes. Around 22 percent to 47 percent of your calories should come from carbs, including fibrous vegetables and fruit. Choose from all sorts of veggies, including artichokes, asparagus, beets, bell peppers, broccoli, tomatoes and greens. Unlike other forms of a low-carb diet, fruits are allowed as well, unless you’re severely overweight or have symptoms of metabolic syndrome. In that case, you should limit high-sugar fruits such as grapes, bananas, cherries and mangoes. But low-sugar fruits, including apples, avocado, berries, melon, papaya and plums, are allowed for everyone. Eggs are allowed on the Paleo Diet, as they're a good source of protein and healthy fats. But you should buy enriched eggs with omega-3 fatty acids and limit your consumption to only six to 12 a week. Nuts and seeds are allowed on the Paleo Diet; however, you should only eat 4 ounces a day or less if you're trying to lose weight. Purchase only raw, unsalted nuts to avoid taking in too much sodium. If you're unsure about which type to eat, your best bet is walnuts, says Cordain. But you can also eat almonds, cashews, chestnuts, hazelnuts and other types -- all but peanuts, which are actually legumes and not allowed on the Paleo Diet. The Paleo Diet encourages consuming 28 percent to 47 percent of your calories from healthy fats. Focus on eating monounsaturated fat, which is found in olive oil, nuts and avocados, as this type can help lower blood cholesterol and prevent artherosclerosis, says Cordain. Avoid saturated and trans fats entirely, and watch it with polyunsaturated fats. Omega-3s, which are found in fish and fish oils, reduce risk of chronic diseases, but omega-6s in vegetables oils, baked goods and snack foods should be avoided. The Dr. Oz Show: Paleo Diet Craze: Does It Work?